The U.S. state of New Jersey is on the Atlantic coast south of New York. New York Harbor and the Hudson River estuary are on the northeastern border of the state, while Delaware Bay and the Delaware River estuary are on the southwestern border. Thus New Jersey has the form of a peninsula with navigable waters on three sides. Most of the ocean coastline is low and sandy, with barrier islands broken by occasional inlets. 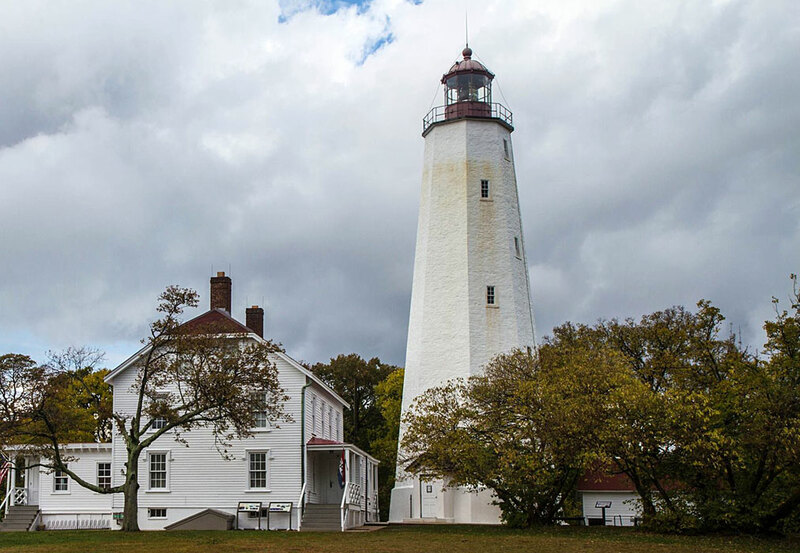 New Jersey is home to the oldest U.S. lighthouse (Sandy Hook) and several other very historic light stations. Lighthouse preservation is strong in the state. Nearly all the onshore towers have support groups working actively for their restoration and maintenance, and it would be hard to name another area of comparable size with so many historic lighthouses as fully preserved as those of the New Jersey shore. The New Jersey Lighthouse Society provides guidance and support at the state level. 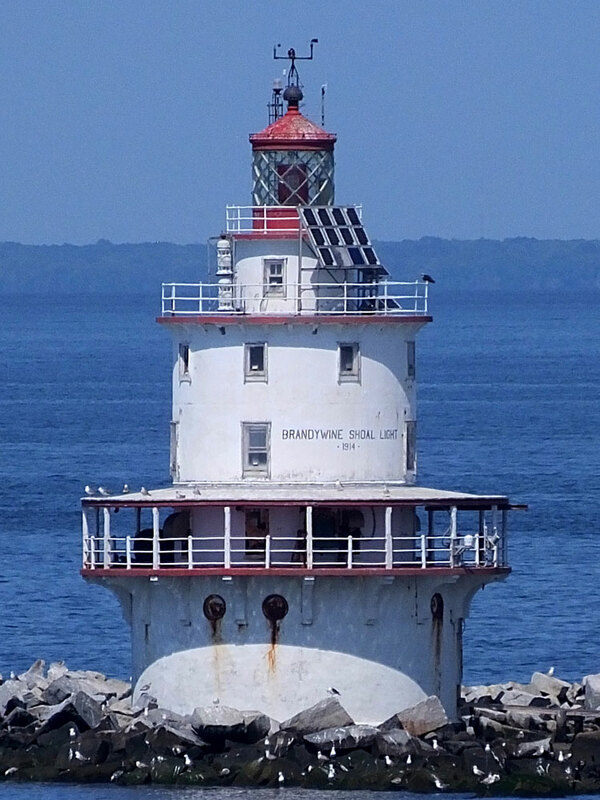 Navigational aids in the United States are operated by the U.S. Coast Guard, but ownership (and sometimes operation) of historic lighthouses has been transferred to local authorities and preservation organizations in many cases. 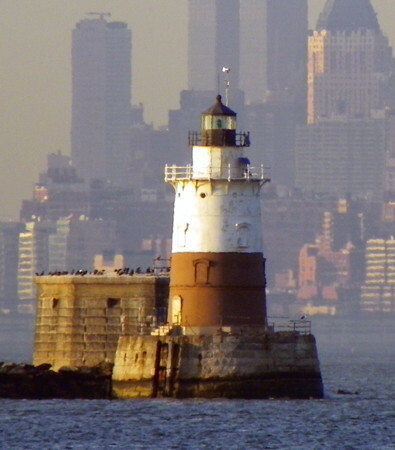 Lighthouses in the New York area are the responsibility of the Coast Guard First District, while those in the rest of the state fall under the Fifth District. ARLHS numbers are from the ARLHS World List of Lights. Admiralty numbers are from volume J of the Admiralty List of Lights & Fog Signals. 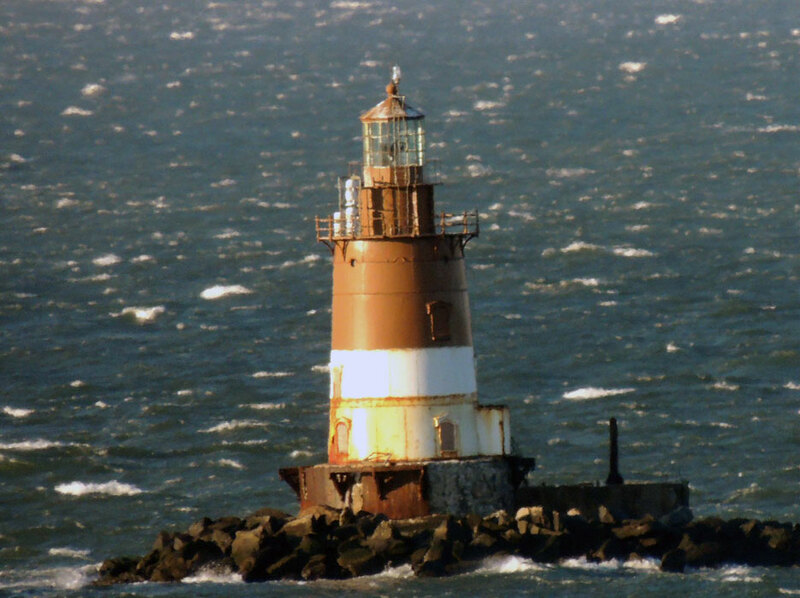 USCG light list numbers for New York Harbor lighthouses, including Sandy Hook and Navesink, are from Vol. I of the U.S. Coast Guard Light List. The remaining USCG numbers are from Vol. II. The society works for the preservation of all the state's light stations. 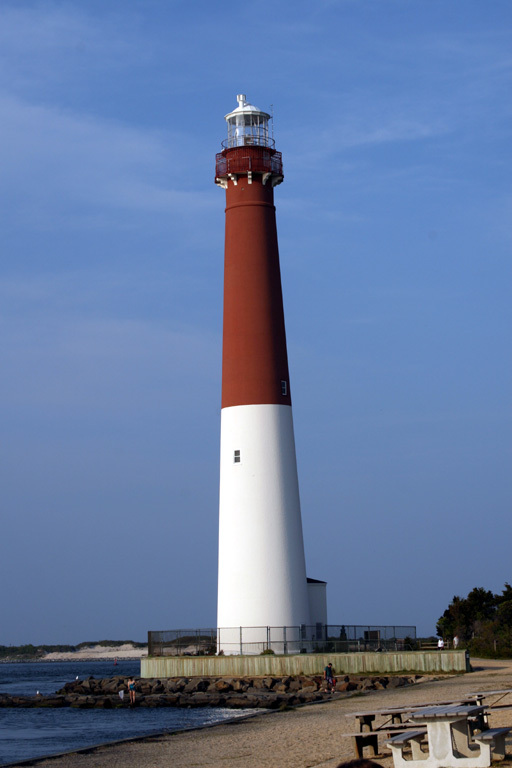 The web site includes an index page for New Jersey Lighthouses, with links to information on all the sites. This event brings lighthouse fans to the all the state's major lighthouses during the third weekend in October. 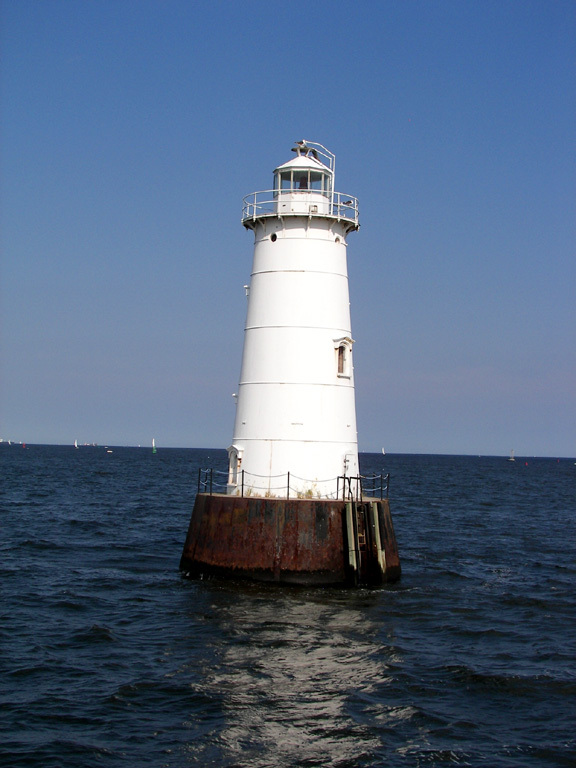 This web site carries information and news about New Jersey lighthouses on the Delaware estuary. Excellent photos, historical information, and travel directions from Kraig Anderson. Note: By several odd twists of history, Liberty Island is part of New York even though the surrounding waters are part of New Jersey. For this reason the Statue of Liberty is considered to be a New York lighthouse while the nearby Robbins Reef Light is a New Jersey lighthouse. To avoid this confusion, both lighthouses are described on both pages. 1923 (Bath Iron Works, Bath ME). Decommissioned 1968. 2-masted steel lightship; length 132 ft (40 m), beam 30 ft (9 m). The light was shown from a small lantern on the foremast. Hull painted red, superstructure white. A 2009 photo is available, Roman Ilyushin has a street view, and Google has a satellite view. The ship was stationed at Cape Lookout, North Carolina, at Winter Quarter Shoal, Virginia, and off the Delaware Capes. After retirement the lightship was sent to Hampton, Virginia, to be a museum, but it isn't clear if it was ever used in this way. By 1984 it was at a shipbreaker's yard in Bordentown, New Jersey, from which it was rescued by its current owner. The ship is well maintained, although its interior has been gutted and replaced with offices. Moored at Liberty State Park near the Statue of Liberty in Jersey City. Site open; vessel status uncertain. Owner/site manager: Liberty Landing Marina. ARLHS USA-902. 1886 (Auguste Bartholdi). Inactive as a lighthouse since 1902; charted as a daybeacon. This 305 ft (93 m) monumental sculpture certainly needs no description. Google has a street view from the Jersey shore, Josh Jett's closeup street view, and a satellite view. The torch of the statue was originally designed as a navigation beacon, and it was so used until 1902. The Statue of Liberty (Liberty Enlightening the World by its official name) is one of America's best known symbols and a very popular destination for tourists. Closed after the 9/11 attacks of 2001, the interior of the statue reopened in August 2004. The statue was closed again after its base was flooded by Hurricane Sandy in October 2012; it reopened on Independence Day, 4 July 2013. Located on Liberty Island (formerly Bedloe's Island) in New York Harbor off Jersey City. Although it is surrounded by New Jersey waters, the island is administered by New York. Accessible by passenger ferry (toll) from Battery Park, Manhattan, and from Liberty State Park, Jersey City. Site and statue open daily. Owner: U.S. National Park Service. Site manager: Statue of Liberty National Monument. 1880. Active; focal plane 61 ft (18.5 m); red flash every 6 s. 60 ft (18 m) sparkplug tower with lantern and upper and lower galleries, including 3-story keeper's quarters, mounted on a cast iron caisson; 155 mm lens. Lighthouse painted white, including lantern. Trabas has Michael Boucher's photo, a 2018 photo is available, Marinas.com has good aerial photos, and Google has a satellite view. 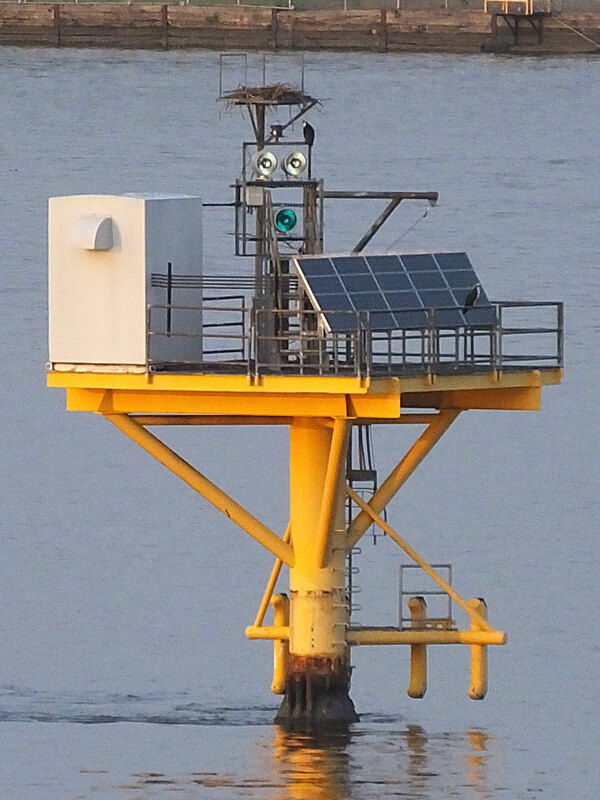 This light belongs to a class of sparkplug towers smaller than the Robbin's Reef Light. Standing very nearly on the state line, it is often listed as a New York lighthouse. In fact, construction of the lighthouse was delayed while New York and New Jersey squabbled over which state had control of the site. In 2010 the light became available for transfer under NHLPA. No organizations came forward to receive it, so it 2011 it was sold at auction ofr $90,000. The new owner is not known.Located in the mouth of the Raritan River off South Amboy. Accessible only by boat. Site and tower closed. Owner/site manager: private. ARLHS USA-344; Admiralty J1058; USCG 1-36430. 1894 (station established 1856). Inactive since the 1950s. The lighthouse, a 105 ft (32 m) cast iron skeletal tower, was demolished in the late 1950s despite protests from local residents who wanted to preserve it. 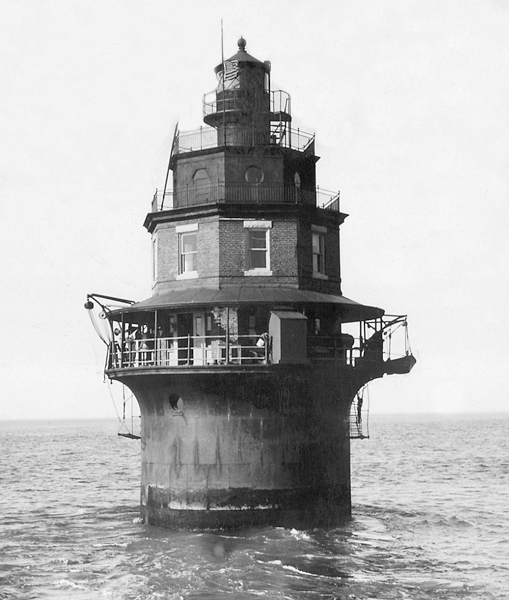 NJLHS has a good page for the original light station, and Huelse has a historic postcard view. The 2-story wood keeper's house survives and is in use as a private residence. Google has a street view of the house, and Bing has an aerial view. The house is located at 203 Creek Road in Keansburg, between Terrace Place and Frances Place. Site closed (private) but the house can be viewed from the street. ARLHS USA-935. 1926; relocated here in 1941 (station established 1856). Inactive since 1957; charted as a landmark. 40 ft (12 m) square steel conical tower with lantern, gallery, and central cylinder, painted in broad red and white stripes. Larry Myhre's photo is at right, Ann Searle has a good photo, the Coast Guard has a historic photo, Google has a street view, and Bing has an aerial view. 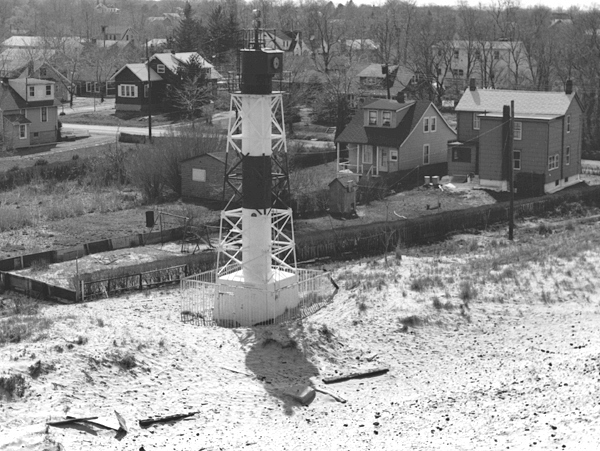 The Coast Guard also has a photo of the original light at this station, which was similar to the original Elm Tree Light on Staten Island. Endangered. 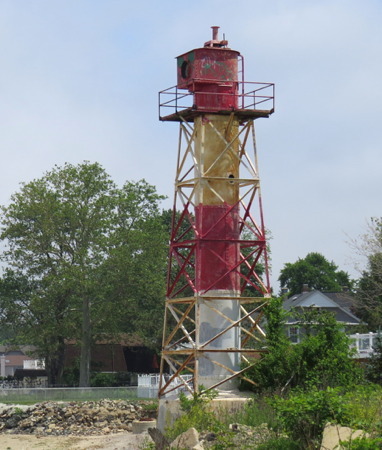 The present tower was originally the second Point Comfort Light (the front range light of the Waackaack Range) and was located at Point Comfort in Keansburg. Huelse has a historic postcard view showing both lighthouses at that location. The tower was repainted red and white in the 1990s by the Leonardo Taxpayer’s Association; the original colors were black and white. In 2004 the lighthouse property was transferred to Monmouth County for management by Middletown Township as a public recreation area. The tower fell into very poor condition and was much in need of restoration; in January 2007 Lighthouse Digest added the light to its Doomsday List. In 2007 a Friends of Conover Beacon Society was being organized to assist with restoration. The tower was repainted and dropped from the Doomsday List, but very little or nothing has been done since, according to an April 2014 visitor. The base of the lighthouse was damaged by Hurricane Sandy in 2012. Located on Sandy Hook Bay between Leonard and Roop Avenues off NJ 36 in Leonardo. Site open, tower closed. Owner: Monmouth County. Site manager: Middletown Township. ARLHS USA-191. 1856 (Richard Carlow). Inactive since 1957. 31 ft (9.5 m) square cylindrical wood tower and lantern on the roof of a 1-1/2 story wood keeper's house. 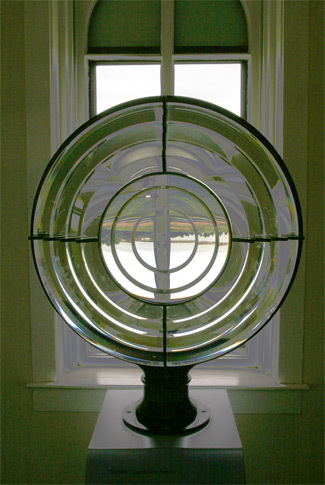 A 4th order Fresnel lens (uncertain date) from this lighthouse is on display at the Navesink Twin Lights Museum. NJLHS has a page for the lighthouse, and Bing has an aerial view. The lighthouse was sold as a private residence when it was deactivated in 1957. 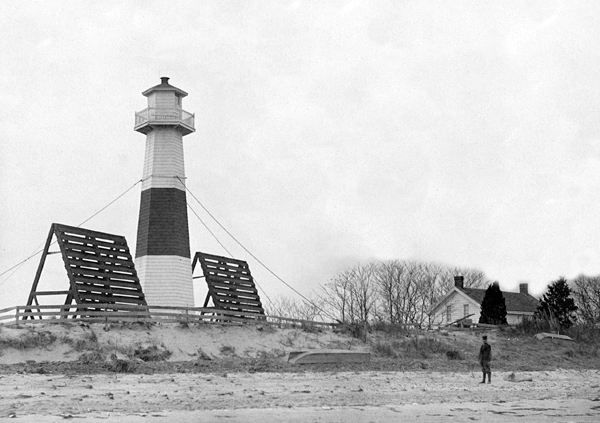 In its original form, as seen in the Coast Guard's historic photo, the lighthouse was a sibling of the New Dorp Light on Staten Island. Subsequent owners have expanded the house. Located off Roebling Drive in Leonardo, inside Sandy Hook. Site and tower closed. Owner/site manager: private. ARLHS USA-153. 1898. 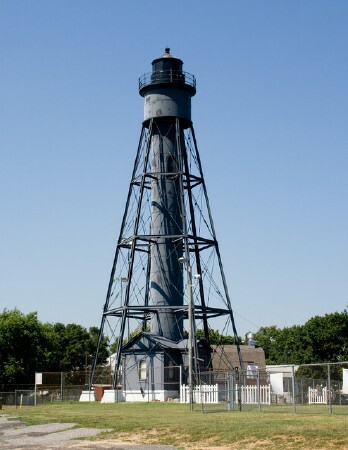 Active; focal plane 54 ft (16.5 m); 2 white flashes every 15 s. 54 ft (16.5 m) sparkplug tower with lantern, double gallery above and a lower gallery as well; including 3-story keeper's quarters; and mounted on a cast iron caisson protected by stone riprap; 190 mm lens. Lower half of tower painted white, upper half red. Fog horn (2 s blast every 15 s). Jeremy D'Entremont's 2008 photo is at right, Trabas has Rainer Arndt's photo, Marinas.com has aerial photos, and Bing has a satellite view. The shoal is named for the pilot boat William J. Romer, which sank after running aground here in 1863. The tower was built originally as an experimental lighthouse at the Lighthouse Depot on Staten Island, New York. The Coast Guard repainted the lighthouse in 2008. In 2010 the light became available for transfer under NHLPA. No organizations came forward to receive it, so in October 2011 the lighthouse was sold at auction for $90,000. 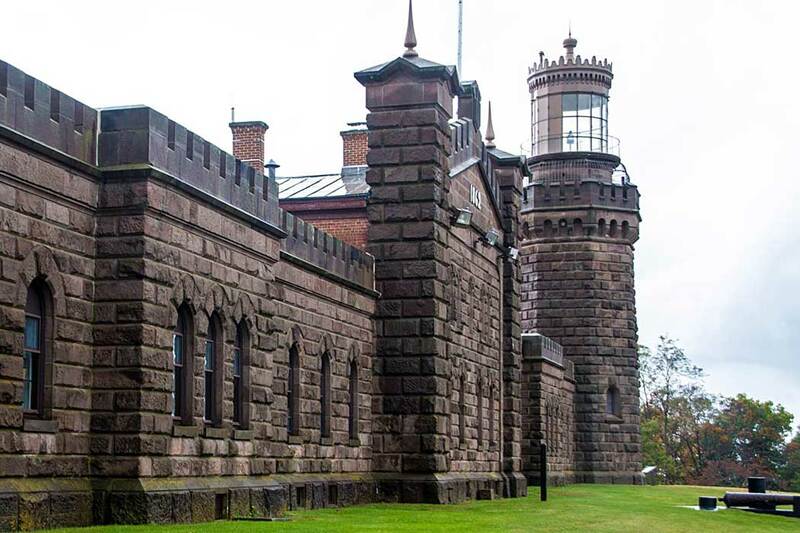 The buyer, John Vincent Scalia, a Staten Island businessman, is working in support of the proposed National Lighthouse Museum and set up a nonprofit organization to manage the lighthouse. However, the lighthouse was damaged by Hurricane Sandy in October 2012 and needs substantial repairs. In 2014 it was named one of New Jersey's ten most endangered historic properties. Fortunately, in December 2014 it received a grant of $501,000 in Hurricane Sandy relief funds. Located on a reef about 4 km (2.5 mi) north of Sandy Hook. Accessible only by boat. Site and tower closed; tours are available occasionally. Owner/site manager: Romer Shoal Lighthouse. Operator: U.S. Coast Guard. ARLHS USA-701; Admiralty J1090; USCG 1-35070. 1917? (station established 1817). Active; focal plane 38 ft (11.5 m); white light, 3 s on, 3 s off. 35 ft (10.5 m) square cylindrical skeletal tower. Fog bell (stroke every 10 s). Trabas has Andreas Köhler's photo, and Bing has an aerial view. This tower replaced an 1880 cast iron lighthouse, which was relocated to Jeffrey's Hook, upper Manhattan, in 1921 (it became famous there as "The Little Red Lighthouse"). Located inside the tip of Sandy Hook at the northern entrance to Sandy Hook Bay. Site open. Owner: U.S. Coast Guard. Site manager: U.S. National Park Service (Gateway National Recreation Area). ARLHS USA-1036; Admiralty J1040; USCG 1-35190. 1999 (station established 1967). Demolished in 2008. This was a 76 ft (23 m) platform carrying a light on a square equipment building, supported by four robust piles. The light stood near the beginning of the Ambrose Channel, the principal channel for entering New York Harbor. Lightships were employed here as early as 1823, and the last lightship Ambrose is on display at the South Street Seaport Museum in lower Manhattan, New York. In 1967 the lightship was replaced by a "Texas tower" platform lighthouse. In October 1996 the tower was heavily damaged by collision with the Greek oil tanker Aegeo. The second lighthouse, installed in 1999, operated for less than four years before being struck by the Maltese freighter Kouros V in January 2001. The light was then replaced by a large buoy painted with read and white horizontal bands (short white flash followed by a long white flash; also a whistle); a photo is available. 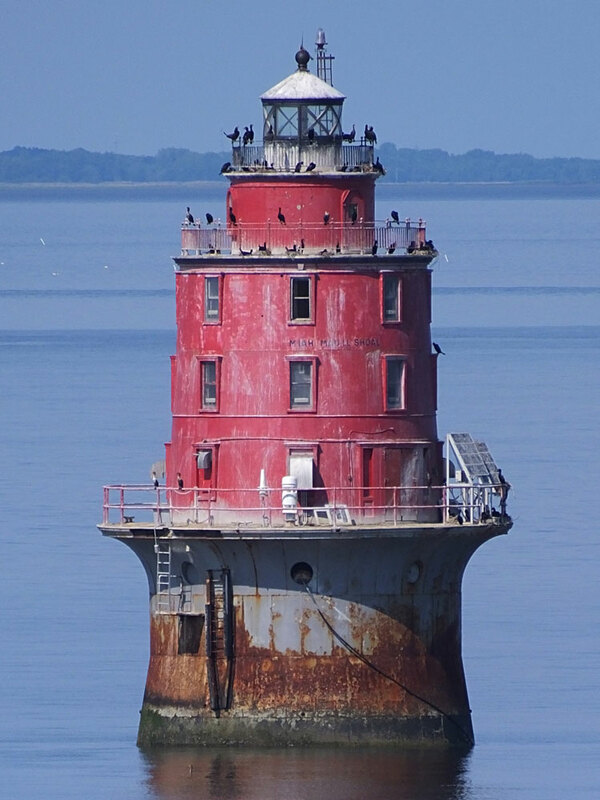 Located about 7.5 mi (12 km) east of Sandy Hook Light. Accessible only by boat. Site open. ARLHS USA-009; ex-Admiralty J1029; USCG 1-34785. 1764 (Isaac Conro). Active; focal plane 88 ft (27 m); continuous white light, day and night. 85 ft (26 m) octagonal rubblestone tower (brick lined) with lantern and gallery, 3rd order Fresnel lens (1857). Tower painted white, lantern red. 2-1/2 story Victorian keeper's house (1883). Oliver Lopena's photo is at the top of this page, Wikimedia has numerous photos, Trabas has C.W. Bash's photo, Marinas.com has aerial photos, and Google has a street view and a satellite view. This is the oldest surviving U.S. lighthouse and the only lighthouse surviving from the colonial period. Lighthouse Digest has John Rust's article on the lighthouse during the American Revolution; the lighthouse fell into the hands of British troops, and efforts by the Americans to destroy it failed. Ownership of the light station was transferred to the National Park Service in 1996. Recognized as a National Historic Landmark, the lighthouse reopened 10 June 2000 after a $600,000 restoration. Greg Jansky has posted a page of photos taken during the restoration. 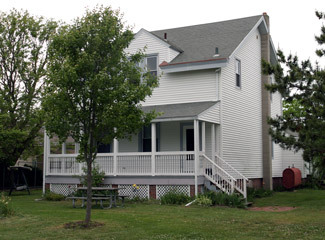 In 2005-06, the keeper's house was renovated as a visitor center with a museum and offices for the Sandy Hook Foundation and New Jersey Lighthouse Society. The 250th anniversary of the lighthouse was celebrated in June 2014. The lighthouse closed in late September 2017 for repairs and renovations; it reopened in late June 2018. Located about 1-1/2 miles south of the point of Sandy Hook at the entrance to New York harbor. Site open daily (entrance is free, but there is a parking fee in the summer); visitor center open daily except Christmas Day and New Years Day; tours of the tower are available during the afternoon, daily April through October and on weekends during the rest of the year. Owner: U.S. National Park Service. 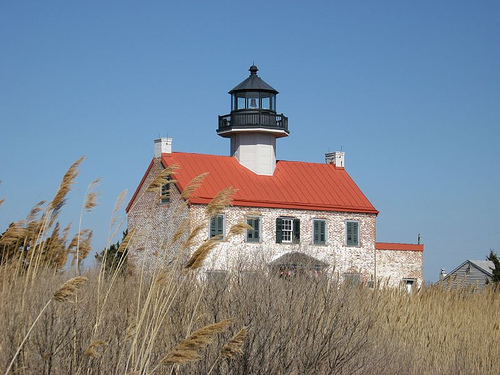 Site manager: Gateway National Recreation Area (Sandy Hook Lighthouse). ARLHS USA-731; Admiralty J1036; USCG 1-35040. 1862 (Joseph Lederle, architect). Station established 1828. Reactivated (inactive 1898-1962, now maintained by the state of New Jersey); focal plane 246 ft (75 m); white light 5 s on, 5 s off. 6th order Fresnel lens (1881) in use. 73 ft (22 m) octagonal cylindrical brownstone tower with lantern and gallery, linked by an ornate, fortress-like structure to the south tower. Trabas has a photo by C.W. Bash, and Google has a street view. The light is listed by the Coast Guard as Highlands Light. The north tower is open during museum hours (see next entry). Owner/operator: N.J. Division of Parks and Forestry. Site manager: Twin Lights State Historic Site. ARLHS USA-530; Admiralty J1032; USCG 1-35025. 1862 (Joseph Lederle, architect). Station established 1828. Inactive since 1953. 73 ft (22 m) square cylindrical brownstone tower with lantern and gallery, linked by an ornate, 2-story fortress-like brownstone keeper's quarters to the north tower. 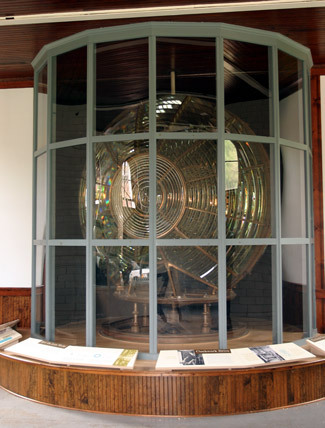 The station's rare 1st order bivalve Fresnel lens (1898), restored in 1999, is on display in the brick electric generator building (1909). The former keeper's quarters now house a museum. Oliver Lopena's photo is at right, Anderson's page has excellent photos and historical information, the state parks agency has a virtual tour, Marinas.com has aerial photos, Huelse has a historic postcard view, and Google has a street view and a satellite view. The Twin Lights are not identical twins, since this tower is square and the north tower is octagonal. For a century Navesink Twin Lights was the landfall light for vessels bound for New York, so it was one of the country's most important lighthouses. It was also a showplace for the lighthouse service. This is the first U.S. light station to be equipped with Fresnel lenses (1841), the first to burn kerosene (1883), and the first to be equipped with electric power (1898). Today the Twin Lights Historical Society supports maintenance and operation of the light station. In 2002 a $460,000 project restored the towers and the exterior of the building. Located on Lighthouse Road off Highland Avenue above NJ 36 in Highlands. Site open (free), museum open daily in the summer and Wednesday through Sunday the rest of the year; north tower open during museum hours, south tower open to guided tours. Owner: N.J. Division of Parks and Forestry. Site manager: Twin Lights State Historic Site. ARLHS USA-530. 1896. Inactive since 1955. 44 ft (13.5 m) square cylindrical tower with lantern and gallery at one corner of a 2-1/2 story Victorian red brick keeper's house. Lantern painted black. A photo is at the top of this page, Anderson's page has excellent photos and a historical account, Chris Piazza also has a good photo, Huelse has a historic postcard view, Google has a street view, and Bing has an aerial view. This lighthouse is similar to the lighthouses at Round Island, Michigan, and Two Harbors, Minnesota, which were built about the same time. The light was moved to a skeletal tower in 1955, but we don't know when this tower was deactivated and removed. 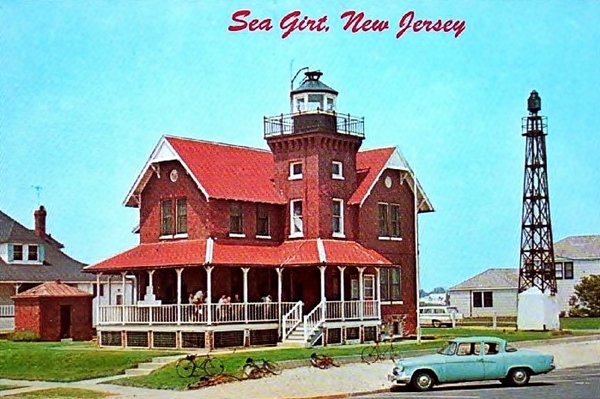 The lighthouse was sold to the Borough of Sea Girt in 1956 and housed the town library for many years. Restored through citizen efforts beginning in 1980, it is used today as a museum and community meeting facility. In 2002 the lighthouse museum spent $20,000 to purchase (on eBay) the 4th order Fresnel lens of the Crowdy Head Light in Australia. 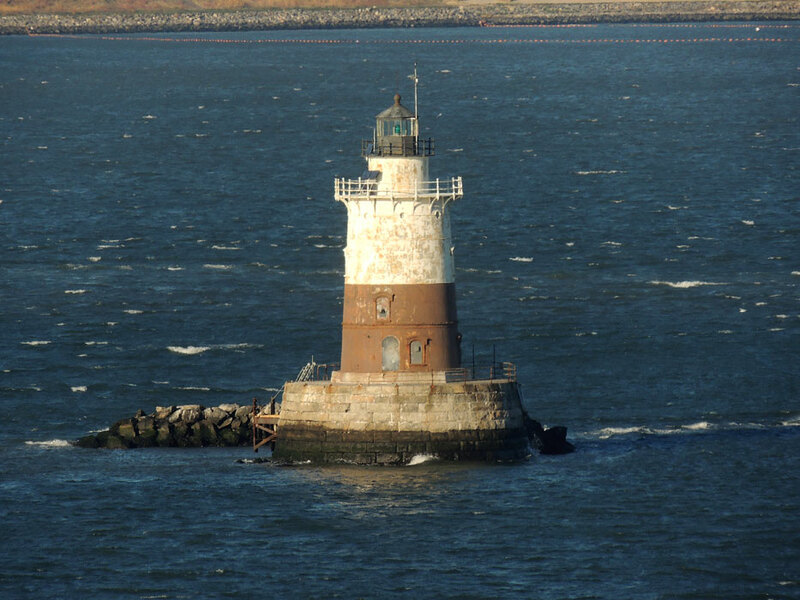 The lighthouse suffered only minor damage during Hurricane Sandy in October 2012. Located at Beacon Blvd. and Ocean Avenue, one block east of NJ 49, in Sea Girt. Site open, lighthouse open on Sunday afternoons April through November except for holiday weekends (free, donations welcome); group tours and school tours can be arranged. Owner/operator: Borough of Sea Girt. Site manager: Sea Girt Lighthouse Citizens Committee . ARLHS USA-744. 1859 (George G. Meade) (station established 1835). Reactivated (inactive 1944-2009); focal plane 163 ft (50 m); white flash every 10 s. 172 ft (52.5 m) brick tower with lantern and gallery. 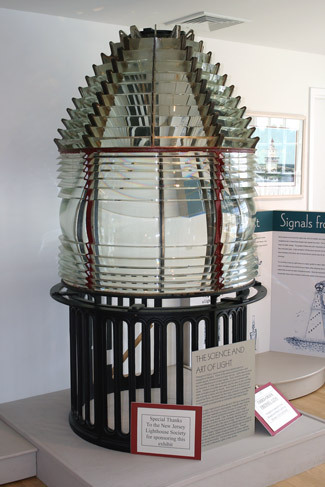 The Barnegat Light Museum, located nearby in a former schoolhouse, displays the original 1st order Fresnel lens. The lower half of the tower and the lantern roof are painted white, the upper half of the tower is bright red. The keeper's house was destroyed in 1915. A photo is at right, Anderson has a fine page for the lighthouse, Long Beach Island also has a page with the history of the light station and a streaming video tour, Trabas has a photo, Wikimedia has numerous photos, Huelse has a historic postcard view, Marinas.com has excellent aerial photos, and Google has a street view and a satellite view. 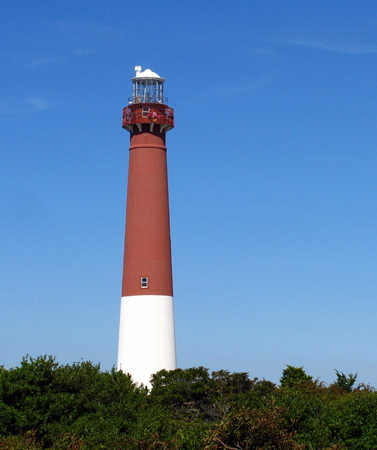 This light, a sibling of Absecon Light, was the tallest U.S. lighthouse when it was built, and it is still the third tallest brick tower in the U.S., according to Lighthouse Heritage data. The Barnegat Light Historical Society and Friends of Barnegat Lighthouse State Park support maintenance and operation of the light station. A major restoration was completed in 1991. The tower is threatened by beach erosion; in 2001 the Army Corps of Engineers spent $1.38 million for a rock seawall to protect it. However, a Corps survey showed the tower is leaning 22 inches (56 cm) away from the vertical. In 2003 the state spent $500,000 to repaint and restore the tower. In September 2008 it was announced that the lighthouse would be relit on New Year's Day 2009. In 2011 town officials were negotiating to lease the light station from the state. In August 2012 a lightning strike knocked out the light, and several months of repairs were needed to restore it. Located at the end of Broadway, off Central Avenue (extension of Long Beach Boulevard), on the north end of Long Beach Island. Site open, lighthouse open daily in the summer and on weekends in the winter. Owner/operator: N.J. Division of Parks and Forestry. Site manager: Barnegat Lighthouse State Park. ARLHS USA-039; Admiralty J1223; USCG 2-0958. 1999 (replica of 1868 lighthouse). A decorative light is displayed. 45 ft (14 m) square cylindrical frame tower with lantern and gallery, rising from the roof of a 2-story frame keeper's house. House painted white, lantern black. Searle has an excellent photo, a 2008 photo is available, and Google has a street view and a satellite view. The original, located on Tucker Island on the north side of Little Egg Inlet, was swept away by a storm in 1927. The replica, dedicated May 13, 2000, is the interpretive center of the Tuckerton Seaport maritime museum. The replica is somewhat larger than the original, an expansion needed to meet modern building codes for a public structure. A light was inaugurated in the tower on New Years Day 2014. Located on Main Street (US 9) opposite Pohatcong Lake in Tuckerton. Site and tower open daily. Owner/site manager: Tuckerton Seaport. 1857 (George G. Meade). Reactivated (inactive 1933-1997, now privately maintained and unofficial; charted as a landmark); focal plane 167 ft (51 m). 169 ft (51.5 m) brick tower with lantern and gallery, original 1st order Fresnel lens. Lighthouse and lantern painted white; tower has a broad black band about 2/3 of the way up. Original 1-story brick oil house. A photo is at right, Anderson's page has good photos and the history of the station, Wikimedia has photos, Huelse has a historic postcard photo, and Google has a street view and a satellite view. Note: Absecon is pronounced ab-SEE-con. The lighthouse is a sibling of Barnegat Light and is one of the first tall brick towers built by the U.S. Lighthouse Board. Anderson describes how the daymark of the lighthouse has changed many times; in the 1950s the tower was painted white with a blue band. A major restoration of the tower was completed in 1998 by Integrated Construction Enterprises with funding from the New Jersey Historic Trust. The keeper's house was also reconstructed in 1998 but then destroyed by a fire of suspicious origin; a second reconstruction began in the fall of 2000 and the building finally opened in October 2001. 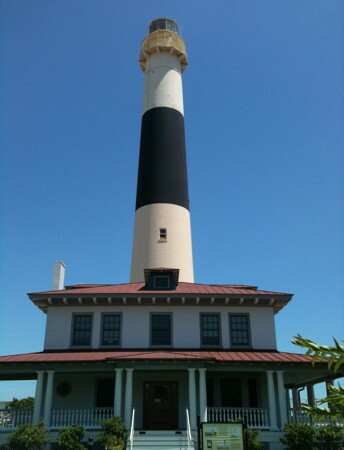 The Inlet Public-Private Association supports maintenance and operation of the light station. In 2014 the Casino Reinvestment Development Authority spent $518,000 to develop a park extending from the lighthouse toward the inlet. Located at Pacific Avenue and Vermont Street in Atlantic City. Site and tower open daily in July and August, Thursday through Monday the rest of the year except for a two week closing over Christmas and New Year's Day. Owner: N.J. Division of Parks and Forestry. Site manager: Inlet Public-Private Association ARLHS USA-001; ex-Admiralty J1238. 1885. Inactive since 1923. Demolished in 2010, this was a 1-1/2 story wood keeper's house, formerly with a square cylindrical light tower centered on the roof. The light tower had been removed and the building had been relocated twice as a private residence, arriving at its final location sometime in the 1940s. 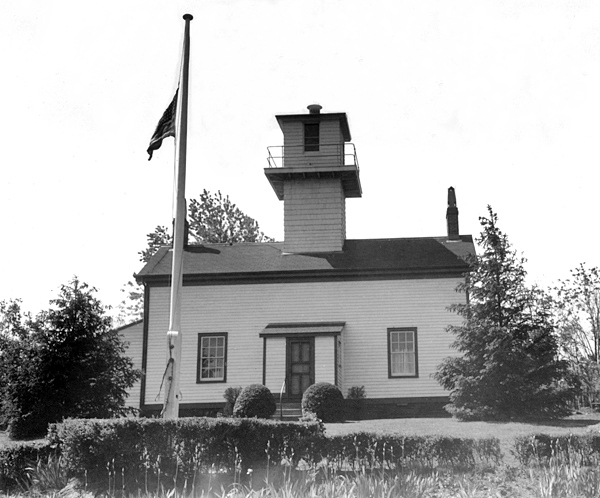 NJLHS has a page for the light station, the Coast Guard has a historic photo, and Huelse has a historic postcard view. In March 2006 the owner, Charles Adams, announced plans to demolish the building and replace it with a modern 4-unit rental complex. Bob Uhrmann, an assistant manager at the Cape May Lighthouse, organized the Friends of Ludlum Beach Lighthouse; the society hoped to save the building by relocating it a third time for use as a museum. Fundraising began, and Adams promised to wait a reasonable time. In August 2009, his patience exhausted, Adams announced plans to seek demolition permits from the city. In December 2009 Sea Isle City Council rejected his development plans, leaving the lighthouse in limbo for 2010. In August 2010 Adams announced that the building would be demolished in late September. 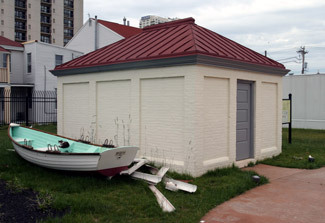 The outlook was bleak, since preservationists had less than a third of the $50,000 needed to move the structure. They failed to raise the needed funds, and the building was demolished on 21 September 2010. Formerly located at 3414 Landis Avenue, Sea Isle City. ARLHS USA-461. 1874 (Paul J. Pelz, architect). Reactivated (inactive 1964-1983); focal plane 57 ft (17 m); white flash every 10 s. 57 ft (17 m) square frame cylindical tower with lantern and gallery, emerging from a 1-1/2 story frame "Swiss gothic" keeper's house. Building painted buff with white trim; lantern painted black. David Slack's photo is at right, Anderson has an excellent page for the lighthouse, Trabas has a photo, Huelse has a historic postcard view, and Google has a street viewand a satellite view. The lighthouse is a sibling of Point Fermin Light in Los Angeles, California; several similar lighthouses were built in California but this is the only one in the eastern U.S. The building is a museum, with the original 4th order Fresnel lens as one of the exhibits. The lighthouse was relocated 150 ft (46 m) west in 1914. The light was moved to s skeletal tower in 1964. Boarded up for 18 years, the lighthouse was restored by local efforts after being leased by the City of North Wildwood in 1982. The Friends of Hereford Inlet Lighthouse supports restoration and operation of the station. The building is now surrounded by extensive gardens. The tower was restored in 1999. 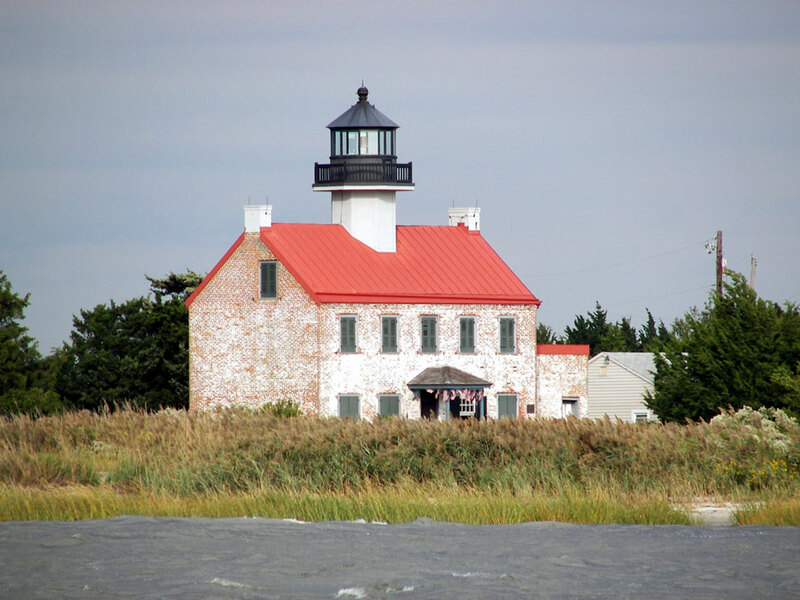 In 2001 the lighthouse received a state grant of $102,000 to replace the modern roof with a historically accurate cedar shake roof and to restore the building's chimneys. 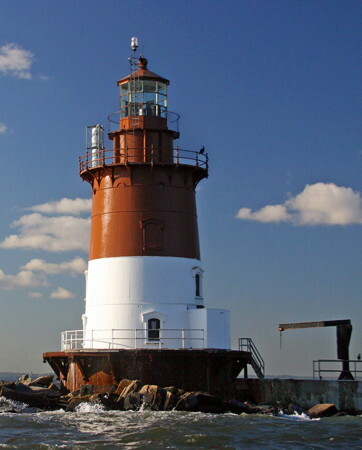 In 2003 the lighthouse was repainted in its historically-accurate buff color, somewhat to the dismay of local residents accustomed to seeing it in white with black trim. Anderson has before-and-after photos. The restoration project won a state Historic Preservation Award in 2005. In 2007 the interior of the building was renovated. In 2015 a local contractor contributed his labor to repaint the lighthouse. Efforts were underway to acquire and restore the adjoining former Coast Guard station. In 2017 the mayor of North Wildwood announced that the city would take over management of the light station as of the start of 2018. This abrupt dismissal of the Friends group and the volunteers who had served the lighthouse for decades shocked lighthouse fans across the country, but the city went throght with its plan. 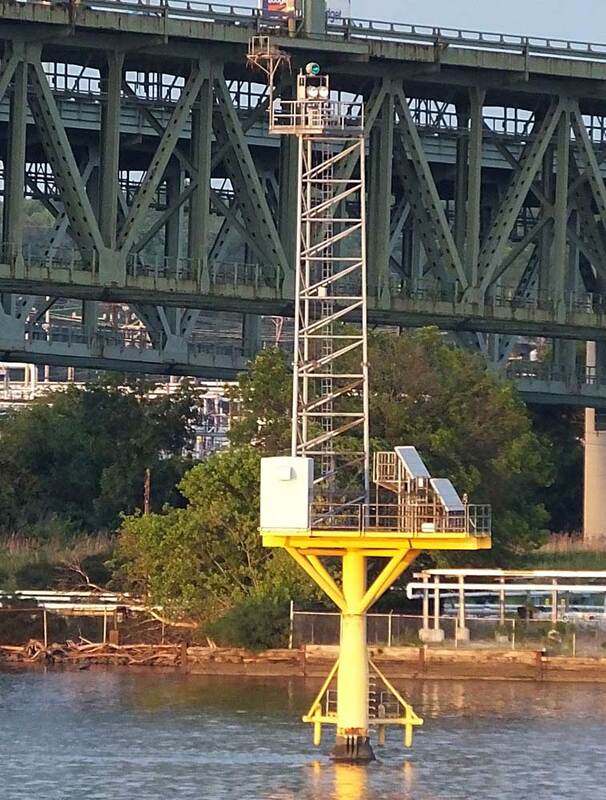 The rotating mechanism of the light failed in May 2018, and the Coast Guard replaced the light with a flashing LED lamp. Located on Central Avenue at First Avenue in North Wildwood. Site open; tower open Thursday through Sunday year round. Owner: N.J. Division of Parks and Forestry (leased to City of North Wildwood). Operator: U.S. Coast Guard. Site manager: City of North Wildwood. ARLHS USA-370; Admiralty J1244; USCG 2-0090. 1859 (station established 1823). Active; focal plane 165 ft (50 m); white flash every 15 s. 157 ft (48 m) brick tower with lantern and gallery, solar-powered aerobeacon (2002). Lighthouse painted white, lantern and gallery red. 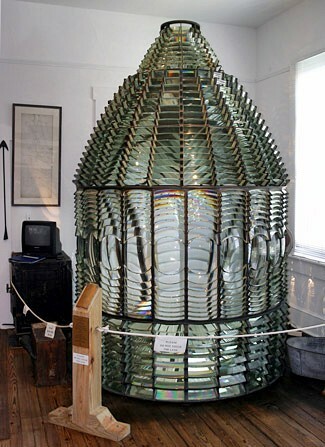 The original 1st order Fresnel lens, removed in 1946, is exhibited at the Museum of Cape May County. The 2-story Victorian wood keeper's house is a park ranger's residence; the duplex assistant keeper's house burned in 1948. The brick oil house (1893) serves as the station's visitor center. Allie Caulfield's photo is at right, Anderson's page has photos and the history of the station, Trabas has a photo, Wikimedia has photos, Huelse has a historic postcard view, Marinas.com has aerial photos, and Google has a street view and a satellite view. 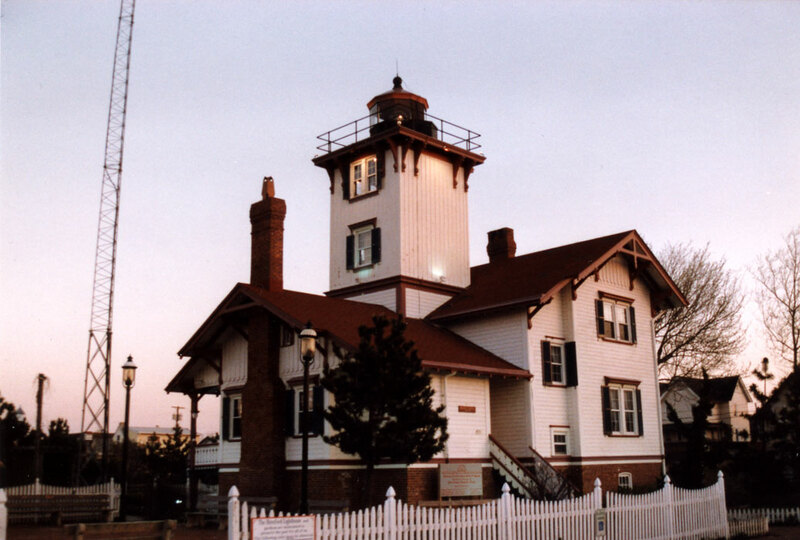 The light station grounds were transferred to New Jersey as a state park in 1964. The tower was leased to the state in 1986, and ownership was transferred in 1992. The tower is leased to the Mid-Atlantic Center for the Arts, which raised funds for a partial restoration and opened the lighthouse to the public in 1988. The International Chimney Corp. completed a major restoration of the tower in 1994; at that time the lantern was repainted in its historic red color. In 2002 the Coast Guard replaced the DCB-36 aerobeacon (1946) with a solar-powered beacon. The lighthouse was repainted in 2017 thanks to federal and state grants and donor contributions. Located on Lighthouse Avenue at Lehigh Avenue in Cape May Point. Site and tower open daily April through November and on weekends in the winter (admission fee). Owner: N.J. Division of Parks and Forestry (Cape May Point State Park). Operator: U.S. Coast Guard. Site manager: Mid-Atlantic Center for the Arts and Humanities (Cape May Lighthouse ). ARLHS USA-127; Admiralty J1256; USCG 2-0155. 1914 (station established 1828). Active; focal plane 60 ft (18 m); white flash every 10 s; red sector covers shoals off Cape May. 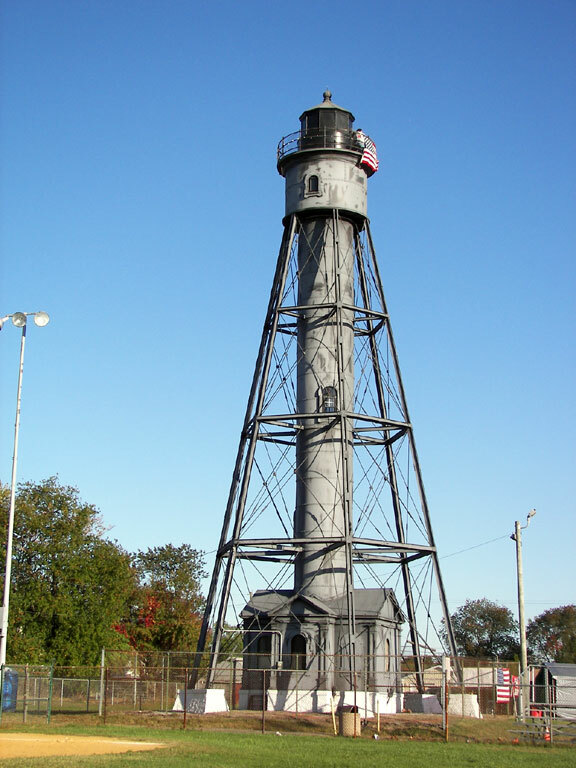 45 ft (14 m) cast iron sparkplug style caisson lighthouse with lantern and double gallery, incorporating 3-story round keeper's quarters. Fog horn (2 s blast every 15 s). 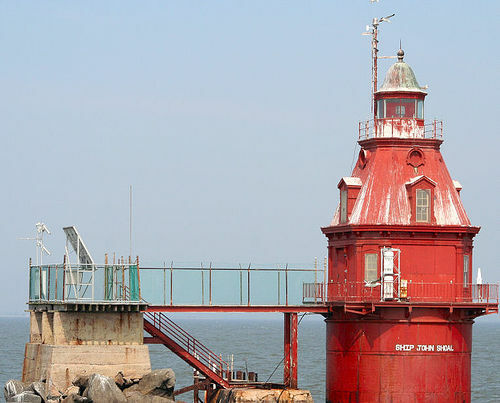 Lighthouse and caisson painted white with red trim, lantern red. Protected against ice damage by rip rap. 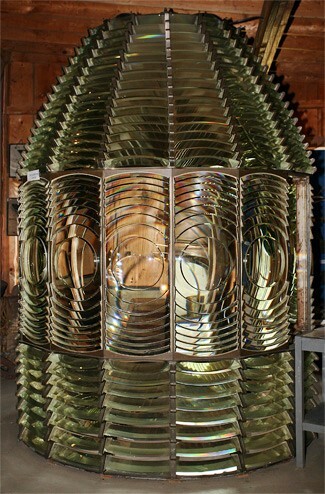 The original 3rd order Fresnel lens is on display at Tucker Island Light in Tuckerton. Part of the screwpile foundation of the previous lighthouse, the nation's first screwpile lighthouse (1850), stands next to the present tower. Diane Hamilton's photo is at the bottom of this page, and Trabas has a photo by Capt. Theo Hinrichs. A sibling of the Miah Maull Shoal Light (see below), this lighthouse is unusual among sparkplug towers in having an intact canopy over the lower gallery. The concrete foundation was recently restored. The Coast Guard repainted the light in 2000. In 2011 the light became available for transfer under NHLPA. 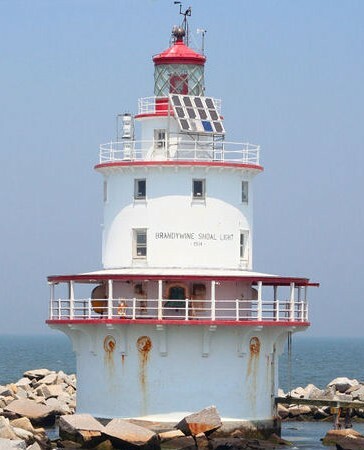 In July 2012 Lower Township officials agreed to accept ownership under one of the proposals, but in February 2013 the park service announced that the lighthouse would be transferred to Brandywine Shoal Lighthouse, a new non-profit started by the company that runs lighthouse cruises in the area. The owner, Capt. Jeff Stewart, estimated the cost of restoring the lighthouse from $1 million to $3 million. So far there's no evidence of a campaign to raise that kind of money. Located in lower Delaware Bay, about 10 mi (16 km) northwest of Cape May. 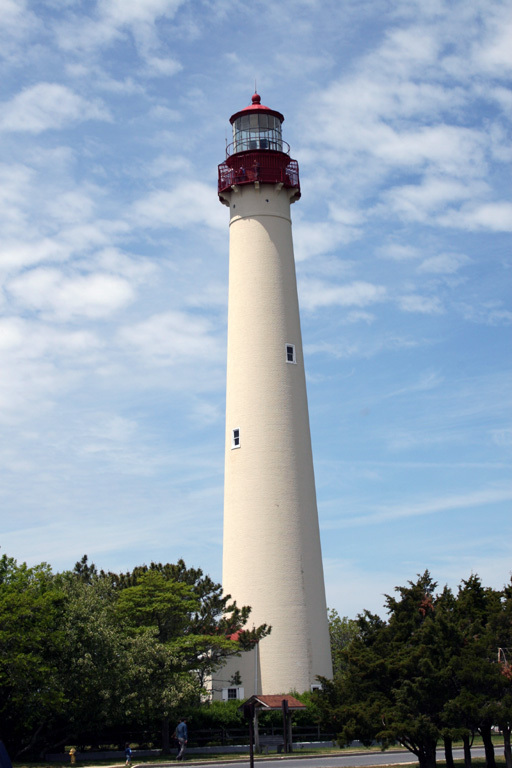 Accessible only by boat; lighthouse cruises from Cape May visit the site. Site and tower closed. Owner/operator/site manager: U.S. Coast Guard. ARLHS USA-076; Admiralty J1264; USCG 2-1555. 1849. Reactivated (inactive 1941-1980); focal plane 43 ft (13 m); white light, 3 s on, 3 s off; red sector covers nearby shoal. 40 ft (12 m) octagonal cylindrical brick tower with lantern and gallery, mounted on the roof of a 2-1/2 story brick keeper's house; 250 mm lens. Light tower painted white, lantern black; building roofs are red. A photo is at right, Trabas has a good photo by Michael Boucher, Wikimedia has two photos, Marinas.com has aerial photos, Brandon Golway has a street view, and Google has a closeup photo and a satellite view. The interior was gutted by a fire in 1971. Local volunteers have worked ever since to restore the light station. Exterior restoration was completed in 1998. Two grants of $300,000 each supported restoration of the interior of the building as a maritime museum. In 2014 there was increasing concern that rising sea level was threatening the lighthouse, now only 120 ft (36 m) from the bay. In August the Corps of Engineers announced it would spend $100,000 of Hurricane Sandy funding to study how best to save the lighthouse. In November, the state allocated $500,000 of the hurricane funding to this project. 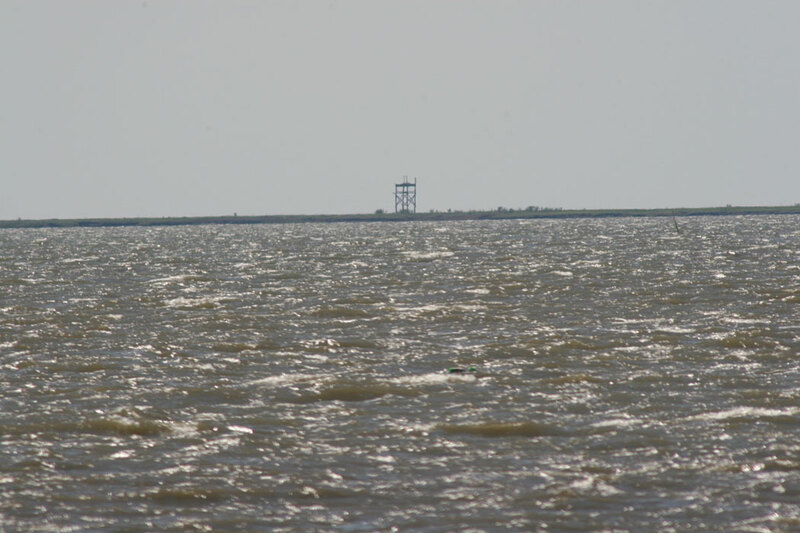 In 2015 the Corps of Engineers announced it would spend $1.9 million for beachfill and a protective berm to curb erosion. In 2016-17 an $852,000 restoration project replaced the roof, repointed the bricks and carried out interior renovations. The lighthouse was reopened and rededicated in September 2017. Located near the end of East Point Road southwest of Heislerville. Site open, lighthouse closed for restoration in 2016. Owner: N.J. Division of Parks and Forestry. Operator: U.S. Coast Guard. Site manager: Maurice River Historical Society (East Point Lighthouse ). ARLHS USA-262; Admiralty J1273.6; USCG 2-1695. 1913. Active; focal plane 59 ft (18 m); white light occulting every 4 s; large red sector covers shoals. 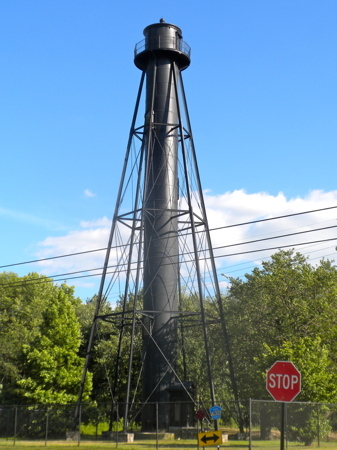 45 ft (14 m) cast iron sparkplug style caisson lighthouse with lantern and double gallery, incorporating 3-story round cast iron keeper's quarters. Lighthouse painted bright red, lantern black with a white roof; caisson is gray. Fog horn (1 s blast every 10 s). 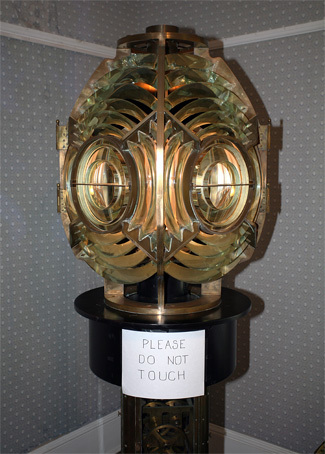 The original 4th order Fresnel lens was removed in 2015 and is on display at the Coast Guard Sector Delaware Bay headquarters in Philadelphia, Pennsylvania. Diane Hamilton has a fine closeup photo, and Trabas has Capt. Theo Hinrichs's photo. In 2011 the lighthouse became available for transfer under NHLPA, and when no organizations qualified to receive it was scheduled for auction in 2012. 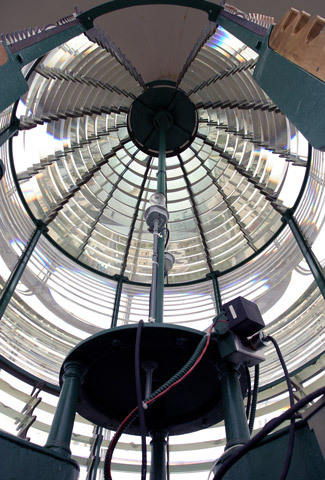 The auction was postponed when the Coast Guard announced plans to solarize the light. The auction sale finally began in July 2015, and in August the lighthouse was sold for $90,000. The buyer has not been identified. Located very nearly in the center of Delaware Bay. Accessible only by boat; lighthouse cruises from Cape May visit the site. Site and tower closed. Owner/site manager: U.S. Coast Guard. ARLHS USA-492; Admiralty J1268; USCG 2-1585. 1875 (station established 1855). Inactive since 1910; charted as an obstruction. Only the hexagonal granite pier remains of this lost lighthouse, which can be seen in a postcard view posted by Huelse. A 2007 photo is available, and Google has a fuzzy satellite view of the shoal. The lighthouse became redundant when the Elbow of Cross Ledge lighthouse was built in 1910. The remains of the long-abandoned lighthouse were burned by the Coast Guard in 1962. There is no longer a light on the pier. Located about 1/2 mile (800 m) south southeast of Elbow of Cross Ledge Light. Accessible only by boat. Site closed. Owner/site manager: U.S. Coast Guard. ARLHS USA-931. 1954 (station established 1910). Active; focal plane 61 ft (18.5 m); white light, 3 s on, 3 s off; red sector to east and northeast covers nearby shoals. Approx. 45 ft (14 m) square skeletal tower mounted on a square workroom, built on the round iron caisson of the 1910 lighthouse; enclosed glass lens formerly used on a buoy. Fog horn (2 blasts every 20 s). Tower painted red, workroom white, caisson black. Bruce Mervine has a photo, a closeup 2007 photo is available, and Google has a fuzzy satellite view of the shoal. The original lighthouse, an octagonal brick tower, was destroyed by a collision with the ship Steel Apprentice in October 1953. Bob Trapani has contributed historic photos of the former lighthouse and the aftermath of the disaster. 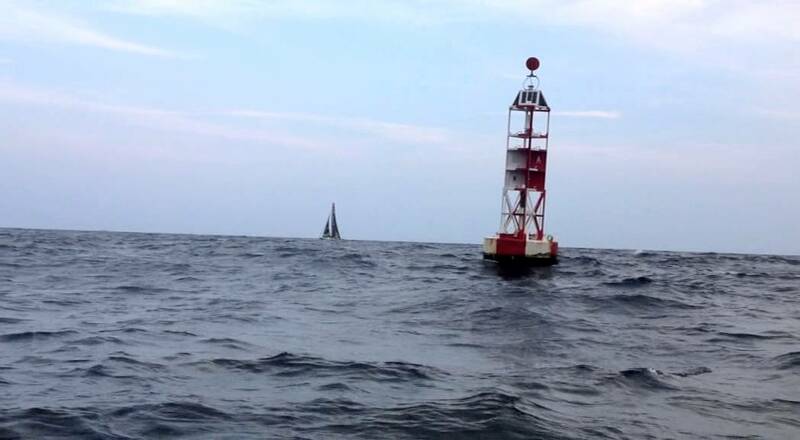 Located in Delaware Bay about 3 mi (5 km) northwest of Miah Maull Shoal. Accessible only by boat. Site and tower closed. Owner/operator/site manager: U.S. Coast Guard. ARLHS USA-270; Admiralty J1270; USCG 2-1600. 1877 (station established 1854). Active; focal plane 50 ft (15 m); white flash every 5 s; red sector to east and north covers nearby shoals. 45 ft (14 m) tower with lantern and upper and lower galleries, mounted on an iron caisson, and incorporating a 2-story octagonal Empire style keeper's house, protected by rip rap. Solar-powered lens (1997); the original 4th order Fresnel lens is at the U.S. Coast Guard Air Station in Atlantic City. Entire structure, including lantern and caisson, painted red. Fog horn (2 s blast every 15 s). A fog bell from the lighthouse is on display at the John DuBois Maritime Museum in Greenwich. Automated NOAA weather station. Diane Hamilton's photo is at right, Marinas.com has aerial photos, and Google has a satellite view. One of only two lighthouses of this unusual design (the other is Southwest Ledge at New Haven, Connecticut). The lighthouse was exhibited at the Centennial Exposition in Philadelphia in 1876. In 2011 the lighthouse became available for transfer under NHLPA, and when no organizations qualified the lighthouse was sold at auction for $60,200 late in 2012. The new owner is not known. Located about 3 mi (5 km) southwest of Cohansey Point and a similar distance southwest of Sea Breeze. 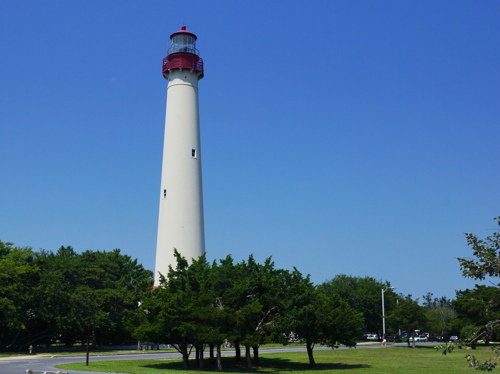 Accessible only by boat; lighthouse cruises from Cape May visit the site. Site and tower closed. Operator: U.S. Coast Guard. Owner/site manager: private. ARLHS USA-758; Admiralty J1272; USCG 2-1640. Date unknown (station established 1838). Active; focal plane 42 ft (13 m); flash every 4 s, white or red depending on direction. Approx. 11 m (36 ft) square skeletal tower, painted black. No photo available, but Google has a satellite view. The original lighthouse was heavily damaged by a storm in 1879. It was replaced in 1883 by a lantern atop a 1-1/2 story wood keepers house. Deactivated and replaced by a skeletal tower in 1913, the second lighthouse was destroyed by a "mysterious" fire on 21 July 1933. 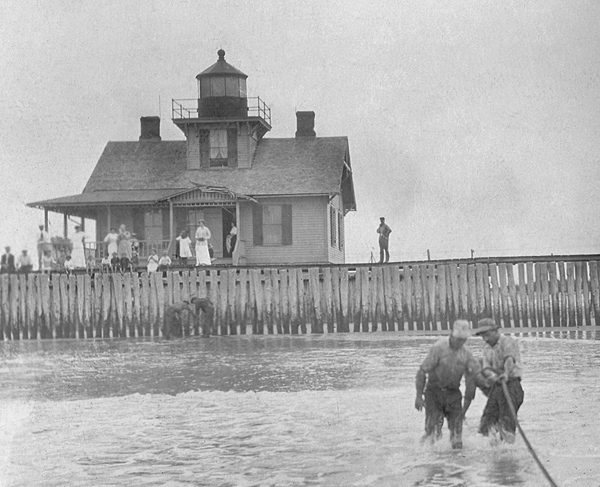 Lighthouse Digest has a Coast Guard photo of the 1883 lighthouse, and NJLHS has a historic postcard view. Located on a sandy island off the mouth of Cohansey River, about 6 mi (10 km) south of Greenwich. Accessible only by boat. Owner/operator: U.S. Coast Guard. ARLHS USA-1033; Admiralty J1293; USCG 2-1990. 1877. Inactive since 1950; charted as a landmark. 105 ft (32 m) hexagonal wrought iron skeletal tower with central cylinder, lantern and gallery. Entire lighthouse and lantern painted black. Keeper's house destroyed; a frame oil house survives. Sibling of Liston Range Rear DE. The tower was restored in 1983-84 as a result of local preservation efforts. A 2010 photo is at right, Jim Tryon has a 2007 photo, and Google has a street view and a satellite view. For many years the tower was open on the third Sunday of each month, April through October, but in 2006 staff cutbacks put an end to these openings. In 2012 the Fish and Wildlife Service repainted and refurbished the lighthouse, and in March 2013 it was reopened for climbing. The Friends of Supawna Meadows organization seeks funds to maintain and restore the lighthouse. Located on Lighthouse Road just off Fort Mott Road in Pennsville. Site open; tower open for tours on the third Sunday afternoon of each month April through October, unless heat and humidity are excessive. Owner: U.S. Fish and Wildlife Service. Site manager: Supawna Meadows National Wildlife Refuge. ARLHS USA-285. Date unknown (station established 1876). Active; focal plane 89 ft (27 m); continuous light, green at night and white in the daytime, visible only on the range line. 89 ft (27 m) triangular cylindrical skeletal tower on a round platform supported by a heavy pile. Pile and platform painted yellow. Trabas has a photo, and Google has a satellite view and a distant street view. The front light is a shorter tower on a similar platform. The original lighthouse was a hexagonal wrought iron skeletal tower, a sibling of the Finns Point lighthouse (previous entry). The replacement lights actually stand in Delaware waters, although the rear light is only about 400 ft (120 m) from the New Jersey shore. Located on the south side of the Delaware Memorial Bridge (I-295), near the New Jersey shore. Accessible only by boat. Site open, tower closed. ARLHS USA-219; Admiralty J1308.1; USCG 2-2910. About 1980 (station established 1880). Side-by-side square steel skeletal towers built on the concrete foundation of the original lighthouse, a square "pepperpot" wooden tower. Mifflin Range Front: active; focal plane 48 ft (14.5 m); green light, 1 s on, 1 s off, day and night, visible only along the range line. Tinicum Island Range Front: active; focal plane 38 ft (11.5 m); red light, 1 s on, 1 s off, day and night, visible only along the range line. Trabas has a photo, Anderson has a good photo, NJLHS has a small photo (at the bottom of the page), and Google has an aerial view. Located at Bramell Point in Billingsport, north of Paulsboro and across the river from Philadelphia International Airport. Site and tower closed (surrounding property owned by DuPont Corporation), but there is a distant view from Fort Billingsport Park in Paulsboro. Owner/site manager: U.S. Coast Guard. Admiralty J1315.8; USCG 2-3285 (Tinicum Range Front) and 3370 (Mifflin Range Front). ARLHS USA-932. 1880. Active; focal plane 112 ft (34 m); continuous red light, day and night, visible only along the range line. 86 ft (26 m) hexagonal skeletal tower with central cylinder, lantern and gallery; DCB-24 aerobeacon (1989) mounted on the gallery. Entire lighthouse and lantern painted black. 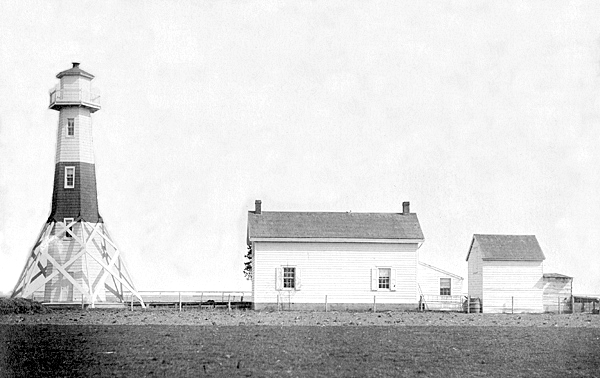 The keeper's house and other light station buildings were demolished about 1940. Bash's photo is at right, Robert English has a good photo, Trabas has Michael Boucher's photo, Huelse has a historic postcard view, and Google has a street view and a satellite view. Sibling of Finns Point and Liston (Delaware) range lights. The Coast Guard repainted the lighthouse and made repairs to the handrails in 2000. Tours of the tower were suspended in 2017 due to structural concerns; after repairs and repainting the lighthouse reopened to the oublic in September 2018. Located in a city recreation area on Second Street at Beacon Avenue in Billingsport, north of Paulsboro. Parking available. Site open; tours of the tower are available on Sunday afternoons of the third full weekend of each month, April through October. Owner/operator: U.S. Coast Guard (leased to Borough of Paulsboro). 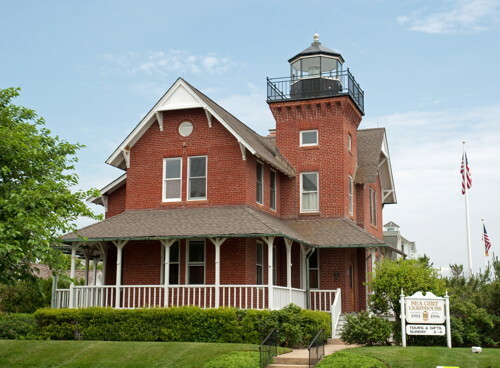 Site manager: Tinicum Rear Range Lighthouse Society. ARLHS USA-852; Admiralty J1315.9; USCG 2-3290. 1881. Inactive. The light tower, a 41 ft square pyramidal frame tower, was demolished long ago. The 1-1/2 story frame keeper's house was relocated to a site adjacent to Cundey's Motel on US 130 in Westville, but a recent visitor to the site reported that the house has been demolished. ARLHS USA-381. 1904 (New York Shipbuilding Co., Camden NJ). Decommissioned 1967. 2-masted steel lightship, length 116 ft (35.3 m), beam 28.5 ft (8.7 m). The ship served almost all its career off New Jersey, first off Cape May and then for four decades off Barnegat Inlet. Wikipedia has an article, Marinas.com has aerial photos, there is a historic photo of the ship marked as the Five Fathom off Cape May, and Google has a satellite view. After the ship was withdrawn from service it was donated to the Chesapeake Bay Maritime Museum in St. Michaels, Maryland. In 1970 the museum sold the ship to the Heritage Ship Guild, which exhibited the ship at Penn Landing in Philadelphia during the 1970s and 1980s; Wikimedia's photo was taken in 1970 by Jerrye and Roy Klotz. Gravely endangered. 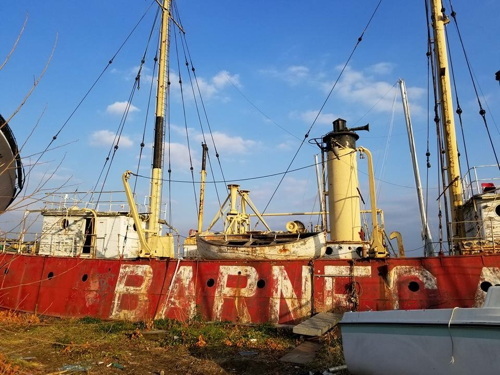 The Barnegat is now at Pyne Poynt Marina in Camden, where it is deteriorating rapidly with very little hope of being saved. The ship was on the Lighthouse Digest Doomsday List until lightships were dropped from that list. Dan Berger's summer 2017 photo at the bottom of this page shows the sad state of the vessel. Rod Sadler, the marina owner, bought the ship in 1993 with hopes of restoring it. In 2018 Preservation New Jersey placed the ship on its Ten Most Endangered list with hopes of starting an effort to raise the several million dollars that would be needed to save it. Sadler died in March 2019, throwing still mre uncertainty on the ships' future. Site and vessel closed but there should be a view of the ship from the adjoining Pine Point Park, at the end of North 7th Street in Camden. One visitor reports that he had quite a difficult time locating this site. Site manager: Pyne Poynt Marine Services. ARLHS USA-040. 1892 (J. W. Wheelan Co., West Bay City MI). Decommissioned 1951. Only the mast survives of this lost lightship. The mast appears in a Wikipedia photo, Google has a 2013 street view, and Bing has an aerial view. The ship spent much of its early career on the southeast coast, but it finished with 17 years of duty at the Stonehorse Shoal station in Nantucket Sound, Massachusetts. The ship has been scrapped but its mast and lantern were displayed for many years at Giovi's Restaurant on US 130 in Yardville. Giovi's closed around 2005 and the lantern fell into disrepair. In 2007, however, a new restaurant opened, and the new owners restored the lantern and repainted the mast. Unfortunately, the restaurant was not a big success and in late 2008 the property was once again for sale. Eventually it was sold, and another restaurant opened, but it has now closed as well. Located at the intersection of US 130 and NJ 156 in Yardville. Site open. Owner/site manager: unknown. Bergen Point (1859-1949), at the junction of Newark Bay and Kill van Kull. The lighthouse was demolished when the waterways were widened in the area, and there is no longer a fixed light at the junction. ARLHS USA-052. Deepwater Range Front (1876-1952), Delaware River at Deepwater. 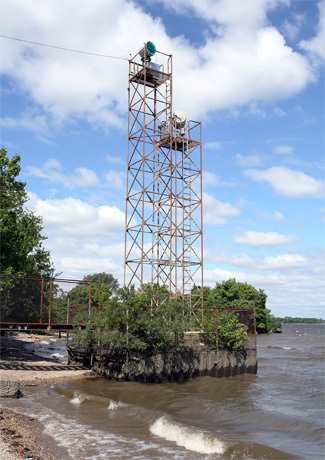 The lighthouse was demolished; the modern light is offshore in the Delaware River. See the entry for the rear range light above. ARLHS USA-218. Egg Island Point (1838-1950), Delaware Bay. The light was moved to a skeletal tower in 1921. The deteriorating lighthouse survived until it was destroyed by fire on 20 August 1950. The light has been replaced an offshore skeletal tower; Trabas has a distant view, and Google has a satellite view. ARLHS USA-267; Admiralty J1274; USCG 2-1945. Finns Point Range Front (1877-1939), Delaware River near Pennsville. Foundation ruins were rediscovered in 2015; Lighthouse Digest has a March article. ARLHS USA-284. 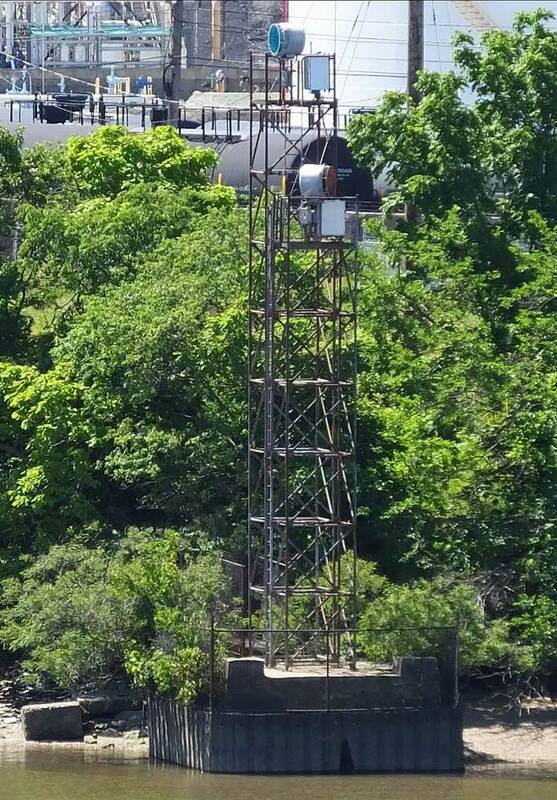 Fort Mifflin Range Lights (1880-ca.1980), Delaware River at Billingsport; the current Tinicum Range Front Light is built on foundations of former Fort Mifflin Range Front Light. Huelse has a historic postcard view of the rear light. ARLHS USA-932 (front) and 293 (rear). Horseshoe Range Lower Front and Upper Front (1881-? ), Delaware River below Gloucester. There are no longer any range lights in this area. ARLHS USA-383 (lower) and 382 (upper). Maurice River Cove Range Lights (1898-1958), Delaware Bay. This station consisted of two post lights with a keeper's house. The abandoned house burned on 27 April 1958. There is no longer a range for the river entrance. ARLHS USA-1034 (front) and 1035 (rear). Passaic (1859-1930s), Newark Bay at the mouth of the Passaic River. This handsome lighthouse was demolished in the 1930s after being deactivated in 1914. ARLHS USA-933. Point Comfort (1856-? 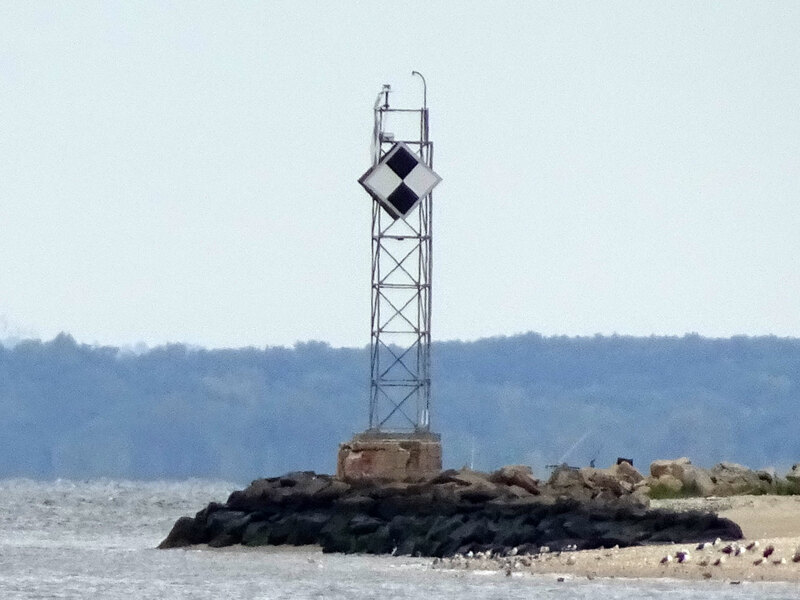 ), Sandy Hook Bay in Keansburg. The second lighthouse is the Conover Beacon, which was relocated to Leonardo (see above). There is no longer a light on the point. ARLHS USA-934. Brigantine (1926) has a very well known faux lighthouse at the foot of the bridge from Atlantic City; it is not an aid to navigation. The Shanklins have photos, and Google has a street view and a satellite view. The lighthouse was refurbished in 1995, and in 2013 local contractors contributed labor and materials for a restoration of the building. Curtin Marina (1978? ), on the Delaware River at Burlington. This lighthouse appears to be active but it is not an official aid to navigation. The marina has a closeup photo, Google has a street view, and Bing has an aerial view. LeFrak (1980s? ), on the Hudson River Walkway in the Newport neighborhood of Jersey City. Built by a real estate developer, this attractive lighthouse has never functioned as a navigational aid. Wikimedia has Mark Wyville's photo, Bence Ujj has a street view, and Google has a satellite view. Lake Lenape (1939), Mays Landing. This 65 ft (20 m) wood tower was never an aid to navigation. Now owned by Atlantic County, the lighthouse is endangered by its age and poor maintenance; a group called Friends of the Lighthouse is raising funds for its preservation. Joe Barrett has a good photo, and Google has a satellite view. Checked and revised May 29, 2018. Lighthouses: 24. Lightships: 3. Site copyright 2018 Russ Rowlett and the University of North Carolina at Chapel Hill.